Picked this beer up at Bootleggers in Topsham and enjoyed it after work. 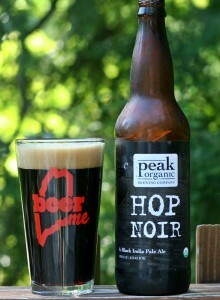 I am a sucker for anything with the word Hop in the name and I generally like Black IPAs. This one did not disappoint with a truly black appearance and two finger tan head. Aroma has lots of citrus and resinous hops, maybe a little roasted malt but mostly hops. Taste is complex with lots going on; resin hops, citrus hops, a bit of chocolate sweetness. Not sure everything works so well together but overall it is a tasty brew. One thing that stands out is the lack of alcohol taste or smell even with the 8.2% ABV. No indication of this even as the beer warms which is impressive. Overall this is a nice example of a black IPA but I still find the various flavors competing instead of complementing one another. Certainly a beer you should try if you like the style. Brewers Description: Hop Noir is a delectable Black IPA, dripping with piney, aromatic Centennial hops. The malt base is dark and rich, anchored by organic black malt. This provides a strong foundation for the extravagant kettle hopping and dry-hopping that this beer experiences. Enjoy with a night-light.